Ceremony unveiling signs for Officer Chris Kilcullen Memorial Highway, and honoring his service and family. Senate Bill 987, supported by Lane County’s entire legislative delegation was passed and signed by Oregon’s governor. 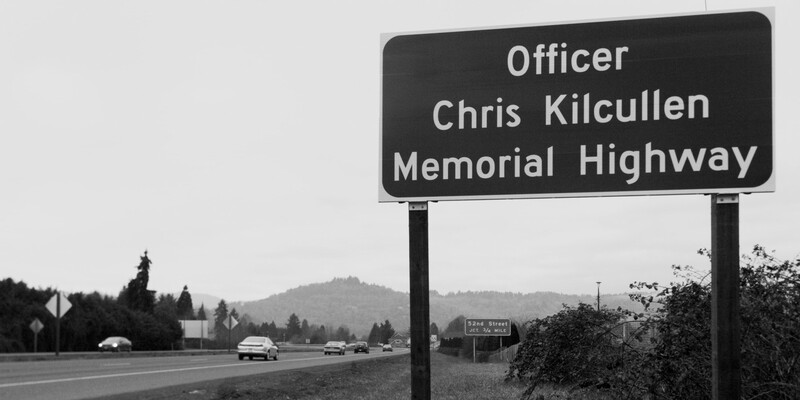 It designates the Officer Chris Kilcullen Memorial Highway to run from Interstate 105 starting at W. 6th Avenue in Eugene, running north and then east to Interstate 5, where it turns into Highway 126, and continuing east to where it joins Main Street in Springfield. The stretch of highway was significant in officer Kilcullen’s life as it was an area he frequently patrolled as a member of the Traffic Enforcement Unit, the route he followed for his daily commute and encompasses the location where ultimately he lost his life. Along with the renaming, the stretch of highway will be memorialized by four large signs that will be placed along the route.